THE BLANQUIL PREMIUM-GRADE, THERAPEUTIC FIRST “TRUE” WEIGHTED BLANKET FOR SLEEP, STRESS & ANXIETY OFFICIALLY LAUNCHES AND AVAILABLE NOW! The world around you is a stressful place. The barrage of news headlines. The incessant push notifications. The demands of your job. It’s never been harder to turn your mind off, relax, and recharge. Weighted blankets have been used in the medical community for decades now and the measurable health benefits have begun to emerge in scientific studies. So far, the findings have been incredible. We know your anatomy is unique, which is why we’ve engineered BlanQuil to meet your personal needs. This isn’t a weighted blanket for everyone. It’s a weighted blanket for you. David Fuchs, CEO and Founder of BlanQuil “The world is a stressful place and some of us just need a Hug or want to be cuddled. The BlanQuil provides that and more. We are truly excited about making people feel better’. What is the BlanQuil Weighted Blanket? BlanQuil is a premium-grade, therapeutic weighted blanket that utilizes the power of deep touch stimulation to effectively support the body. Engineered to be around 10% of your body weight, BlanQuil helps relax the nervous system by simulating the feeling of being held.This relaxation increases the release of serotonin and melatonin levels all the while decreasing cortisol levels— resulting in an improved mood and restful sleep. BlanQuil uses the power of proprioceptive input, more commonly known as “deep touch pressure stimulation”, a well regarded therapeutic method that stimulates pressure points on the body linked to improved sleep, mood, and relaxation. The result of the stimulation is a reduction in cortisol levels and an increase in both serotonin and melatonin production, which decreases heart rate and blood pressure. BlanQuil is designed to hug you back at night, closely mimicking how a parent cradles their child while they sleep. But Blanquil isn’t just for sleep. It can be used while you’re reading in bed, as you relax on your couch, or while you meditate. BlanQuil Blanket's weighted filling is a High Density Plastic Poly Pellet. The material is odorless, non-toxic, and food grade, making it perfectly suited for use in a blanket. They are dense to add weight, and soft to provide a nice texture to the Blanquil Weighted Blanket. High Density Plastic Pellets are manufactured using High Density Polyethylene (HDPE), which is extremely durable, non-toxic, washer / dryer safe, and pet and kid friendly. The Blanquil is currently available for purchase online at https://myblanquil.com/products/blanquil-quilted-weighted-blanket or on Amazon at https://www.amazon.com/BlanQuil-Quilted-Weighted-Blanket-Grey/dp/B07887WMLR and starts at around $169.00. 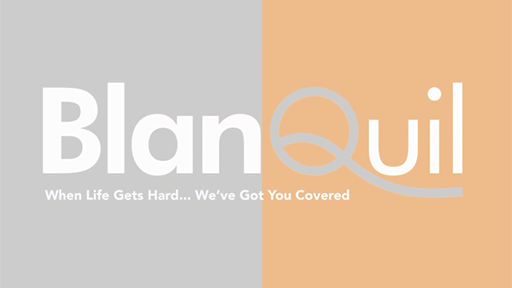 To get more information or purchase your Blanquil, Visit myblanquil.com.